A collection of colorful plates ($5.99 each) combine graphic elements from Wondermooi characters. This eye-catching rug ($79.99) features a dense pile that helps mute sound. The line also includes stationery and other paper products, including a line of decorative boxes that sell for $10.99 each. At $4.99, the collection's porcelain mugs are a cheery way to kick off the day. Recalling traditional Tibetan tiger rugs, the priciest piece of Van Beirendonck's collection is a $99 rug feature the Wondermooi superhero Kwade Tijger. When tapped by IKEA to create a capsule collection, Walter Van Beirendonck didn't begin with a sketch—he started with a story. The designer invented an entire world of inspiration, one populated by the Wondermooi, a group of five cloud-dwelling characters whose personalities weave themselves through every piece in the collection. 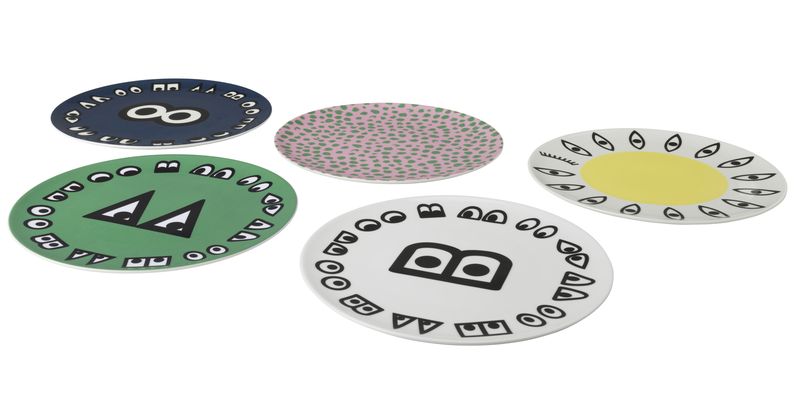 With the whimsical world of the Woondermooi as a starting point, Van Beirendonck created a colorful collection of home accessories called GLÖDANDE that's sure to inject a little fun into any room. In addition to the accessories, which are available in-store and online, plans for each of the five Wondermooi figures can be downloaded for 3D printing, complete with instruction on how to paint them. But, if you do download these figurines, why not take a cue from Van Beirendonck and color boldly outside the lines?